java කියන්නේ මොකද්ද කියන එක ගැන අදහසක් මේ වෙද්දී තියනවා කියලා හිතනවා.ගොඩක් අයට java ඉගෙනගන්න බැරි වෙන්නේ java එක්ක වැඩ කරන්න පටන් ගන්න බැරි වීම.අනිත් languages වල වගේ install කරලා වැඩ කරන්න බැහැ java වල.ඒ ගැන තමයි මේ පොස්ට් එකෙන් කියන්න යන්නේ. මුලින්ම මෙතනින් ගිහින් java download කරගන්න.අලුත්ම version එක java 8.මෙතැනදී ඔයා අරගන්නේ JDK 8 එක.ඒ කියන්නේ java SE development kit එක.java run වෙන environment එකක් තියනවා.ඒක හරියට update එකක් වගේ.ටික කාලෙකට සැරයක් අලුත් වෙනවා.නමුත් JDK එක එහෙම නැහැ.සැලකිය යුතු කාලෙකට සැරයක් තමයි අලුත් එකක් එන්නේ.දැනටමත් java install කරලා නම් තියෙන්නේ ඔයා අරගන්න ඕන JRE එක.එතකොට environment එක අලුත් එකට update වෙනවා.ඒක මෙතනින් ගන්න පුළුවන්. මුලින්ම සාමාන්‍ය විදියට JDK එක install කරගන්න.ඊටපස්සේ තමයි වැඩේ පටන් ගන්නේ.මෙතැනදී කරන්නේ java කියවන්න පුළුවන් කෙනෙක් ඉන්නේ කොතනද කියන දේ windows වලට කියන එක.නැත්තන් එයා දන්නේ නැහැ කවුද java ගැන හොයලා බලන්නේ කියලා. මේ ජාවා කියවන්න පුළුවන් කෙනා තමයි java compiler කියලා හදුන්වන්නේ.මේ ගැන ඉදිරියේදී පොස්ටුවකින් විස්තර කරන්නම්.මේ javac.exe එක තියෙන්නේ C:\Program Files\Java\jdk\bin වගේ location එකක windows 7, 8 හා 8.1 වලදී.C එකට ගිහින් ඔයාගේ computer එකේ directory එක අරගන්න. 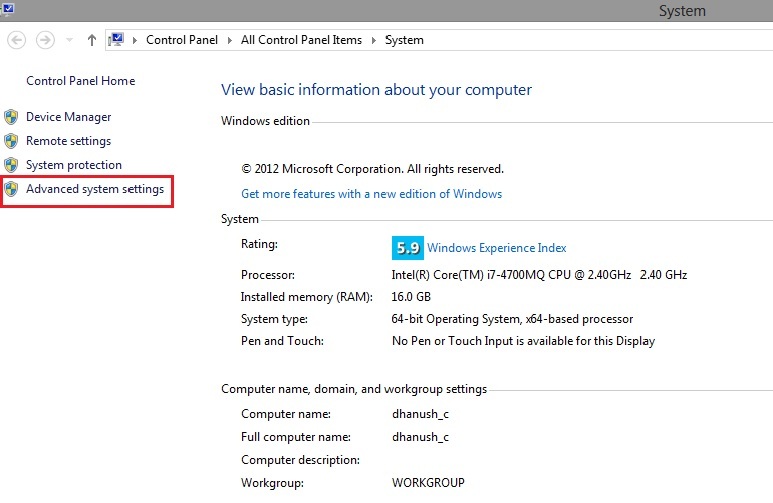 දැන් My Computer වල properties වලට ගිහින් එතනින් Advanced System Settings වලට යන්න. 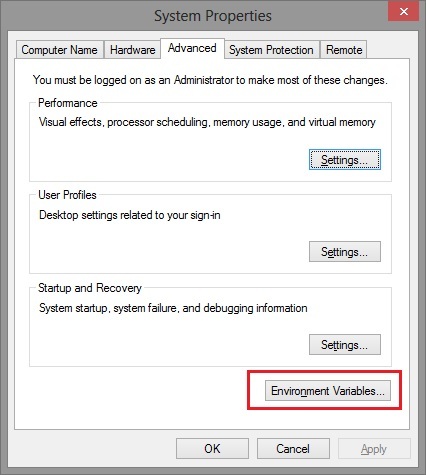 ඊළගට open වෙන window එකෙන් Environmental Variables කියන button එක click කරන්න. 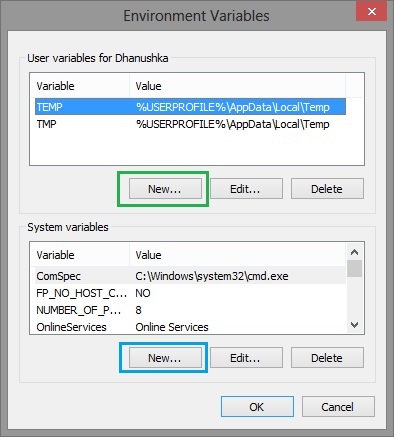 ඊළගට open වුනු window එකේ path කියලා varialble name එකක් නැත්තන් මේ විදියට කරන්න.දැන් වැඩ කරන user account එකට විතරක් java path එක සෙට් කරන්න නම් කොළ පාට new එක click කරන්න.සේරම account වලට ඕන නම් නිල් පාට new එක click කරන්න. ඊටපස්සේ තමයි අර javac.exe එක තියන directory එක ඕන වෙන්නේ.පහල image එකේ විදියට Variable name eka Path කියලා දෙන්න.variable value එකට අර directory එක දෙන්න. සේරම window OK කරන්න.path කියලා එකක් තිබුනොත් පහල image එකේ විදියට edit තෝරන්න. value එකේ අගට ගිහින් ‘ ; ‘ semicolon එක දාලා අර directory එක paste කරන්න. 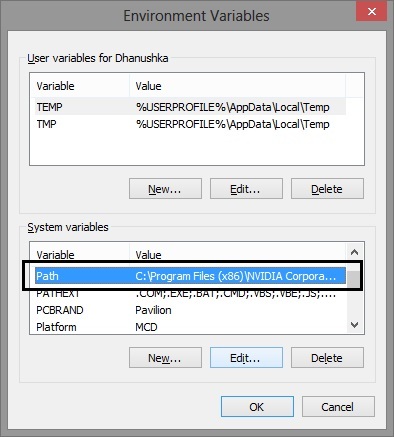 දැන් java install කරලා path එක set කරලා ඉවරයි.වැඩේ හරිද කියලා බලාගන්න Command Prompt එක open කරලා javac කියලා type කරලා enter කරන්න.මේ වගේ details ටික එනවා නම් වැඩේ හරි. 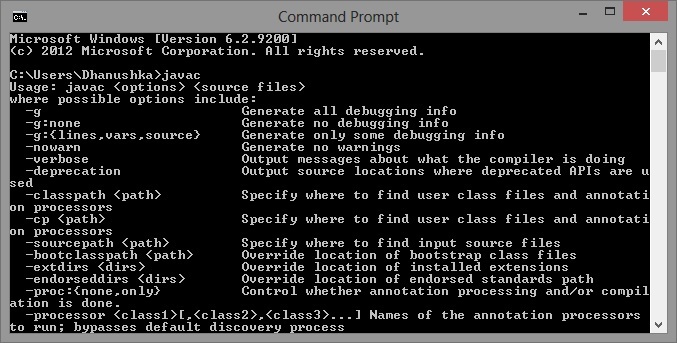 එහෙනම් දැන් java programming කරන්න පුළුවන්.java වලදී භාවිතා වන concept, java programming කරන විදිය ගැන ඊලග පොස්ට් වලදී බලමු. This entry was posted in Java, Programming and tagged java, learn, path set, programming by dhanush_c. Bookmark the permalink.